With crystal clear free-flowing water, towering bluffs, caves, waterfalls, a dense canopy of diverse trees, and too many species of flora and fauna to list, Arkansas’s Buffalo River is a wild and pristine paradise running through the heart of the Ozark Mountains. During the winter months, visitors can experience a special beauty and solitude along the river’s course. The Buffalo originates as little more than a trickle at the confluence of Reeves Fork and Big Buffalo Creek just north of Fallsville, Arkansas in the rugged Boston Mountains. It then flows for 150 miles before joining the White River in the wooded hills of southwestern Newton County. The first 15 miles of the Buffalo pass through Ozark National Forest land. The remaining 135 miles, through the national park. Because the entire river is bordered by public land, the Buffalo offers 22 established river access points. The region boasts numerous full-hookup and primitive campgrounds, and an ever growing number of hiking trails weave through the park’s 95,000 acres. Backcountry camping, as well as camping on gravel bars along the river is allowed. Canoeing is the most popular activity on the Buffalo, and paddlers of all experience levels can find a section of river to meet their skills. The park is divided into three segments: the upper river, middle river and lower river. Along its 150 mile course, the river descends nearly 2,000 feet. The steepest grade is in the upper stretches, where whitewater is common. During spring runoff the upper river can be dangerous. The middle river has a mix a of light rapids, long riffles and lazy pools. The lower river is for the most part slow and wide. The Buffalo is one of Arkansas’ two Ozark Blue Ribbon Smallmouth Streams. The other is nearby Crooked Creek. The Buffalo has a healthy population of smallmouth bass due to excellent habitat, which includes rock ledges, deep pools, fast runs, scattered boulders, undercuts, overhangs, riprap, and plenty of fallen wood. Forage is plentiful, too. Crayfish, hellgrammites, baitfish, amphibians, insects and more make-up a diverse offering for the river’s fish. The Buffalo has a lot of 10 to 14 inch smallies, but currently lacks a significant number of large fish. Four to five pound fish are caught every year, but the majority of the smallmouth you’ll catch on the Buffalo will be about a foot long and weigh around a pound. On an average day, anglers can expect to catch 20 to 30 fish this size. 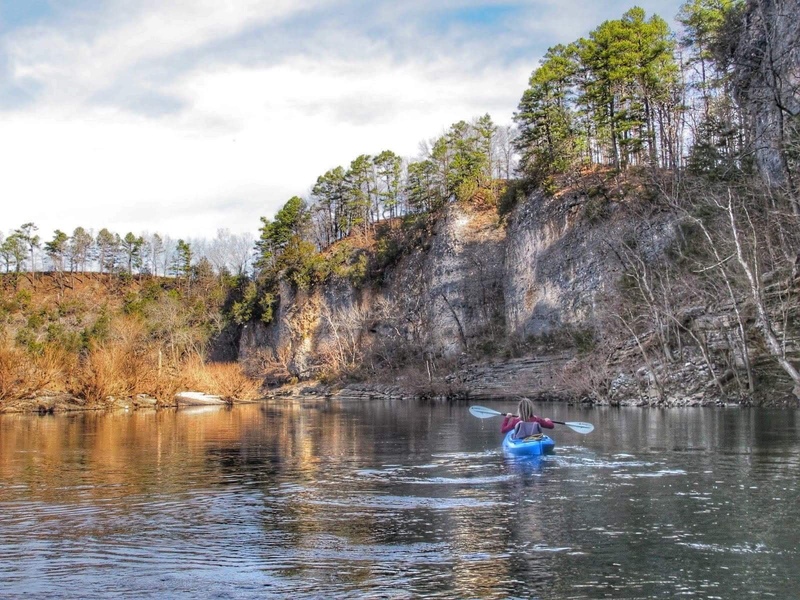 An overnight float and fish is an incredible way to experience the Buffalo River. Gravel bar camping is a quintessential Ozarks experience. Spend the day fishing, then pull over to make camp in a remote location where your nearest neighbor for the night may be more than a mile away. Filet a few goggle-eye, shake them in cornmeal and drop them in oil heated over an open fire. Then sit back, stare at the stars and listen for the lonesome howl of coyote or the beckoning call of a barred owl. The three designated wilderness areas: Upper Buffalo, Ponca, and Lower Buffalo, are highlights of the national park. No motorized vehicles are allowed in the wilderness areas, except for 10 horse power or less boat motors on the lower portion of the river. The 2,200 acre Upper Buffalo Wilderness Area, which adjoins the 11,054 acre Ozark National Forest’s Upper Buffalo Wilderness Area, is home to numerous bluffs and caves, and consists of rough terrain. The 11,300 acre Ponca Wilderness Area, which begins 11 river miles below Ponca and extends to below Kyles Landing, features Hemmed-In-Hollow Falls, a 209 foot single drop falls, that according to the National Park Service, it is the tallest waterfall between the Rockies and the Appalachians. The Lower Buffalo Wilderness Area, at 22,500 acres, is the largest of the three and consists of mostly smooth water from below Buffalo Point down to the confluence with the White river at Buffalo City. The Lower Buffalo Unit adjoins Leatherwood Wilderness, which is part of the Ozark National Forest. In the summer, the Buffalo can be quite crowded. Paddlers descend on the river during warm weather weekends from across the country. Yet, very few people are found on the Buffalo during the winter. If you want to escape the crowds, now is the time to soak in the solitude of one of America’s grandest waters.